CAPTAIN JAMES O'SULLIVAN AND HIS LIFE SAVING APPARATUS. A life saving apparatus to be used in the rescuing of persons from burning buildings has been perfected by James O'Sullivan, for twenty-five years a member of the Kansas City fire department and for a number of years captain of the companies detailed in the Sheffield district. The captain, with the assistance of Alderman A. C. Culbertson, gave a demonstration of his device before the fire and water board yesterday, and the board promptly gave its official approval and ordered John C. Egner, chief, to install it in the department. The efficiency of the device is recommended by its simplicity, and the ease and promptness with which it can be operated . It is made of the stoutest quality of leather, and all there is to it is a body strap and two straps which fit over the shoulders. 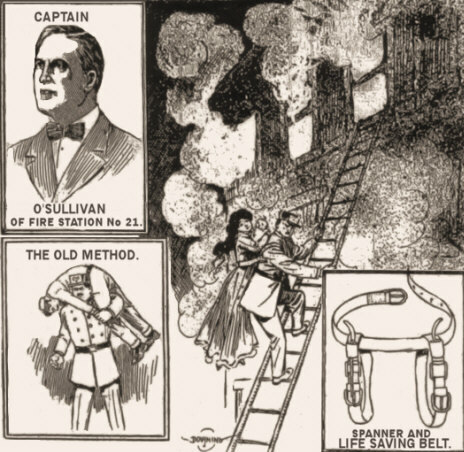 The rescuing fireman buckles the person to be rescued to his back with the waist strap, then runs his arms through the two straps that fit over the shoulders and is ready to descend the ladder to safety with his burden . With this contrivance the fireman has complete use of his hands, a most important necessity in such a trying and exciting situation. It is also possible for the person being rescued to carry children in his arms if the emergency requires. "I got the idea for my life saving device from seeing the firemen rescuing a woman from the burning Pepper building a few years ago," said Captain O'Sullivan. "It occurred to me that something could be made that would lessen the danger of falling from a ladder, both to the rescuer and the rescued, and I have thought out my device which is considered by experienced firemen the best thing ever turned out." Captain O'Sullivan has applied for a patent on his device.